ECG-accurate - provides accurate heart rate data. Time and chronograph functions keep it simple and easy to use. "S"-shaped design curves around the wrist for improved comfort and an easy read. 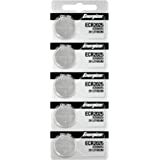 Ergonomic chest transmitter enhances comfort. A battery hatch on chest strap offers easy battery replacement. Water-resistant to 30 meters. 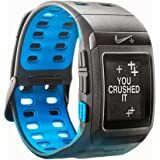 Perfect for beginning runners and working out at the gym, the Nike Triax C3 keeps track of your training time as well as your fitness level with the included heart rate monitor chest strap. 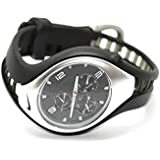 It features basic chronograph timing features (with one alarm and 12/24-hour time) and accurate heart rate measurement. 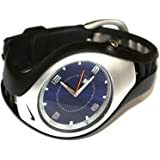 The watch case and co-molded polyurethane strap form a unique S-shaped design that curves comfortably around your wrist for an improved fit and quicker reading of the time. 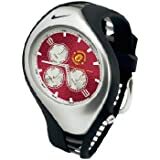 Other features include Nike Electrolite one-touch backlighting, water resistance to 50 meters (165 feet), and a battery hatch on watch and chest strap for easy battery replacement. At the 1976 Olympic Trials, Nike shoes are seen in abundance for the first time--worn by young, rising stars in both middle- and long-distance events. I had been hesistant about heart rate monitors because many of them seemed so hard to understand. 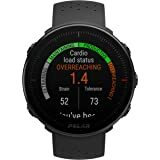 If you are just starting out with a fitness program or want the "simple" things in a heart rate monitor, this is the one. Not complicated to use at all and gives you great readings. Definately recommended!! 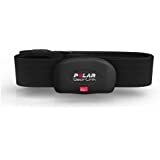 I purchased this basic Nike heart rate monitor from a major warehouse retailer, and although the documentation doesn't mention it, the included heart rate strap is compatible with exercise equipment that are marked "Polar heart rate ready." I use a variety of workout machines at the gym, and the exercise bikes and treadmill picked up my heart rate right away. I only had problems getting the strap to communicate with a Life Fitness elliptical trainer, but I think that may be due to some missing component (perhaps a receiver) in the machine's control panel, because I found an empty compartment underneath it that houses RJ45 ports which could possibly serve as hookups for a plug-in module for the monitor. Anyway, being able to see my heart rate on the exercise equipment is a nice feature, and the heart rate displayed on the machines was within 1-2 beats of the watch. I also took the heart rate monitor for a spin in the pool, and the electronics survived just fine though the documentation warns not to press the watch buttons under water. The strap did have problems staying in place around my chest while swimming, so I probably won't use it in the water much in the future. Overall, I like this heart rate monitor. It's pretty basic in terms of functionality compared to more costly models, but it looks good and does what it's designed to do. I found that I was more motivated to push myself harder in order to keep my heart rate up during my workouts. I don't mind that the watch can only show one value at a time (the time, chronometer, or heart rate), because with such a small display it would be difficult to see all the numbers if everything was crammed onto the tiny screen. Also, the range is limited to within a few feet of my body, but I think that's a good thing because I wouldn't want to pick up a neighbor's heart rate in a crowded gym environment. The only feature I would like to see added is a backlight on the display, but that's a rather a minor complaint because I don't plan on using the watch as my primary time piece. It's sufficient for gym use, so I don't need extra features that regular watches offer. 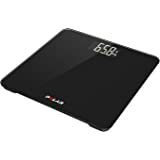 If you need advanced features like calorie count and min/max heart rate alerts, you may want to look at other models. I bought this to replace a Reebok strapless heart rate monitor which was horrible. It was over $100 and was inaccurate, not to mention big and heavy on your wrist. This Nike monitor is nice. It looks good and is comfortable but best of all it gives constant accurate readings. 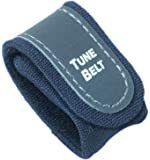 The included chest strap is comfortable and stays in place. I don't notice it and the bulge under your shirt is not conspicuous. This device has been a great tool for my running. I also use it as a watch everyday. It is very basic, and thus very easy to use. The user manual is small. You can find a PDF version online. This device has just 2 buttons and using it is very straight forward. 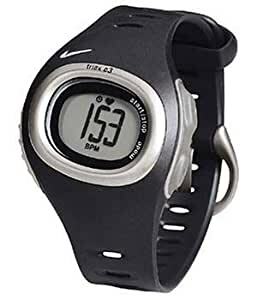 The chest strap can be opened so if the battery dies you may replace it yourself, but Nike says that the heart rate monitor itself needs to be sent to them if the battery dies. That sounds like an inconvenience so if that happens I will probably take it elsewhere. When the chest strap makes contact with your skin, it makes a ticking noise. You can only hear it in a quiet room (I don't hear it when I run) and other people will not notice unless they get right next to your chest and listen to it. This device has a chronograph feature but it only displays seconds, not milliseconds. It has a 12 or 24 hour clock but no second display or date. It does not have an alarm and cannot beep or make noise. There is no light. It is very basic and simple. Conclusion: Accurate, easy to use, comfortable, attractive. What else could you ask for. Well I would like a light and an alarm which explains the 4 star rating. Nevertheless, I still use this as my watch and heart rate monitor. It works well and has had no glitches so far (unlike my previous Reebok HRM). It was susrprisingly cheap and I recommend it. 5.0 out of 5 starsExcellent monitor, Dangerous software! This Nike heart rate monitor is exactly what I wanted in such a device; constant monitoring, comfortable wearing, reasonable price, and a two-year warranty! However, the enclosed CD-ROM really shocked me with its heart rate calculator. The calculator uses the simple formula of 220 minus ones age to arrive at the recommended exercise heart rates; these are at 26 bpm to 59 bpm higher than newer studies recommend! Please enter "heart rate" on Wikipedia to see these newer formulae. This issue is the only reason that I am entering my opinion here, as I regard it as potentially dangerous to many users of this monitor! So, use your better judgement and enjoy your workout! A primitive heart rate monitor (HRM), as heart rate monitors seem to come these days. If you're looking for a simple HRM that can also time your runs (or swims, etc.) and would like to keep spending to a minimum, this product will probably suit you well, as it does me. One drawback, for those of you getting into some longer exercise times....When the timer on the watch gets above 1 hour, the watch no longer counts seconds (rounds to the nearest minute). I'm not sure if other watches do this, but for some reason that annoyed me. I like this watch. I have very small wrists, but it fits well and is comfortable. It is very basic, and all you have to do is set the time. The monitor works well, and provides a constant heartrate, there are no alarms or settings to alert you to highs or lows, or allow any kind of tracking. When you first put it on, it does take a few minutes for it to start giving accurate reads. I like the training cd that comes with it, and provides a calculator feature for determining your ideal ranges. I wish it had a backlight function for viewing in the dark.